DrCousensGlobal.com brand and website are operated by ezWorldShop LLC, NH, USA. The products are shipped from our warehouse in the United States directly to your address. 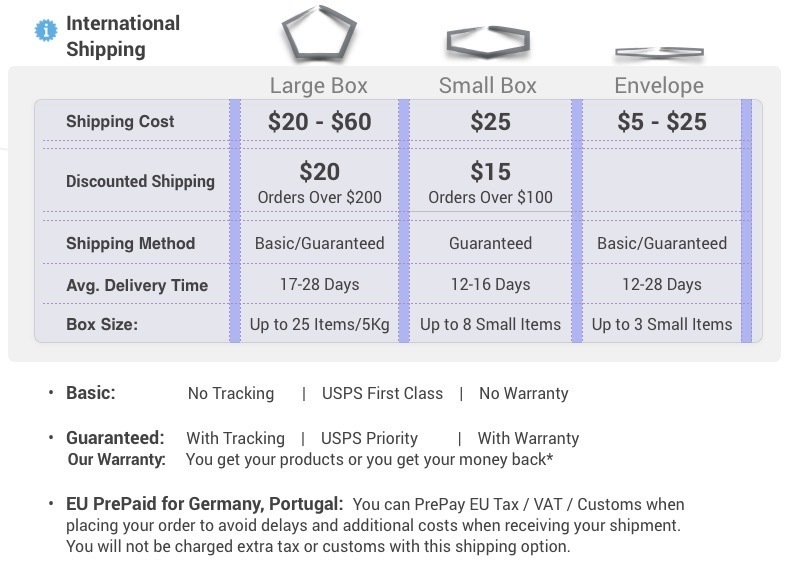 The prices are in US dollars and do not include taxes and customs fees that may be due upon delivery of the parcel to your country outside the United States. Upon receiving your order, you may be asked to pay sales tax, value-added tax (VAT), or other taxes by your local post office, subject to the regulations in your country. DrCousensGlobal is responsible to ship your order and provide full paperwork for customs in your country. DrCousensGlobal is not responsible and can't guarantee the processing and release from customs in countries outside the United States. In order to serve you better, we process orders in amounts up to the maximum of what is generally allowed by international customs for personal consumption. If the shopping cart rejects your order because it exceeds that maximum, please divide your order into smaller purchases. The size and volume limitations per parcel are taking into account general customs restrictions and are imposed in attempt to provide a smoother import experience on receiving your shipment. However, DrCousensGlobal IS NOT RESPONSIBLE FOR PARCELS HELD OR REJECTED BY CUSTOMS IN YOUR COUNTRY. To find out about customs regulations in your country, contact a local import broker in your area. We accept international credit cards. The charge will be in US dollars and will appear in your statement as DrCousensGlobal or ezWorldShop. The currency converter on this website is for providing estimates only. Upon submitting your order, you will receive an order number and a parcel tracking number issued by the USPS (U.S. Postal Service). Delivery schedules vary globally, ranging from 2 to 6 weeks. DrCousensGlobal is not responsible for any delays, loss, or damage to your parcel once it has been collected and transported by the USPS. You can track your order via USPS.com and the Postal Service website in your country. We provide "Guaranteed" (with warranty) and "Basic" service according to the terms of service and shipping procedures of USPS. Supplements orders over $200 are eligible for the flat rate shipping fee of $20. Information within this site is for educational purposes only. Statements on this site have not been evaluated by the U.S. Food and Drug Administration. The products on this site are ‘Dietary Supplements’ and are NOT ‘Medicine’. Products and information on this site are not intended to diagnose, treat, cure, or prevent any disease. DrCousensGlobal representatives are not medical doctors and cannot give medical advice. To receive a medical advice contact a certified health care professional. The information on this site is provided by the manufacturers. DrCousensGlobal and ezWorldShop are providing the manufacturer's information 'as is' and are not held responsible for products description, recommendation of use etc'. Dr Cousens Global runs a promotions and savings program called "Community Pricing". The terms of promotions and discounts may change frequently as displayed on the website at the time of purchase. 1. $1 in cash =10 Points in website currency or store credit. 2. Points have expiration date of at least one year from the date of issuing the promotional points - subject to the promotion given. 3. Point for Purchase Volume: Points are given as bonus for purchase as appearing before checkout. Depends on the items and the volume you buy you will get a bigger points bonus for use on your next purchase. 4. Social Sharing and e Mail: Points are given for social activity such as sharing on social networks or writing a review. Points for social networks are limited to 6 actions per action type within 24 hours. You will get points for the first 6-10 times you share per day on any given social network. 5. Points will only be given for proper, real-person social profile activity. A social profile and activity that is in a good standing with the rules of the social platform such as Facebook, Twitter etc'. Over-use of social sharing, use of fictitious accounts, use of multiple accounts, repeated sharing of the same pages, using of robots, script, spam, or mechanical use of social platform will not be honored and will not earn reward points. Rewards points will only be given for real social activity of sharing information and links from DrCousensGlobal with your real circle of friends or clients. 6. Some products purchases are excluded from earning points: All "The Synergy Company" and "doTERRA" products. Store credit certificate allow you to buy store credit in the currency of Points for discounted price. Points bought on a credit certificate have a 2 year expiration date. Points on unused credit can be changed to cash with 60 days of written request to DrCousensGlobal. You will loose the discount given when changing from points to cash. 1. The friend you referred is a new customer that is not listed on DrCousensGlobal or Tree of Life. 2. The referral fee is 10% from the retail purchase in cash of the person you referred and up to a maximum of $100 per referral. The are no lifetime commissions for referring friends. Your account will be credited 10% of your friend's cash purchases until you reach a total of $100 bonus from that referral. 3. You may refer friends or family. The referral program is limited to one account per household. You may not refer the same person with different accounts, multiple usernames, multiple addresses etc'. Running multiple accounts by the same person or same business will not be honored and will not be eligible for referral commissions. The referral program is only meant to give bonus for referring real and new people from your social or professional circle. I read and accept the full Terms of Service above. b. No Returns Policy: once items are shipped out we do not accept returns in order to ensure the highest quality. c. Supply time outside the USA: is between 9-42 days, normally 9-21 days for most countries, and is subject to the postal service. You can track your order online with a tracking number that we will e-mail you shortly after you've placed your order.